Thank you for your ongoing interest in the Goulburn Regional Partnership and in our 2018 Regional Assembly which took place in Shepparton on Wednesday 18 July. We had 225 community members and senior government leaders attend the Assembly and we’re keen to keep you, our community, up to date with developments, and our work. With that in mind, I am taking this opportunity to write to you as Chair of the Goulburn Regional Partnership. 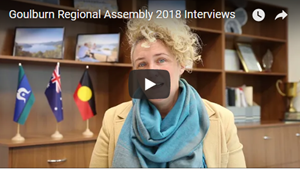 The 2018 Goulburn Regional Assembly was the Partnership’s third major opportunity to consult with the community. In addition to local residents, businesses and organisation representatives, the Assembly was attended by four Victorian Government Ministers: Minister for Regional Development and Agriculture Jaala Pulford, Attorney-General Martin Pakula, Minister for Public Transport and Major Projects Jacinta Allan, and Philip Dalidakis, Minister for Trade and Investment, Innovation and the Digital Economy, and Small Business. We were thrilled to see a considerable number of younger people at the Assembly, which followed a series of meetings between the Partnership and young people across our region. Group discussions with young people took place in Cobram, Nathalia, Yarrawonga, Euroa, Benalla, Seymour, Broadford and Wallan and they were a great opportunity for the Partnership to better understand the issues faced by young people in Goulburn. The Assembly provided the Goulburn Regional Partnership an opportunity to reflect on some of its achievements over the past two years, and then for discussion on some of the hard questions which face our region. Table discussions on the night covered: addressing developmental vulnerability in children, breaking down barriers to education, encouraging healthy lifestyles, improving digital connectivity, public transport, reducing social isolation and improving mental health, reducing stubborn unemployment, supporting young people to be happy and healthy, and tackling crime and substance abuse. As part of the Assembly, we screened a short video about some of the Partnership’s priorities and achievements over the past year. You can view the video here. As a Partnership, our role is now to take the messages and ideas from our 2018 Assembly, and from our wider consultation, and action them. As part of this, we presented to the Rural and Regional Ministerial Committee recently, and we were very pleased with the discussion around our health, education and mental health priorities, as well as the ongoing focus on economic development opportunities. We will of course keep you abreast of announcements and initiatives relevant to our region via our website, email and on our Partnership Facebook page. Again, thank you for giving your time and insight, whether by attending the Assembly, a workshop, a meeting, or being active on our Engage page. This email was distributed by Regional Development Victoria on behalf of the Goulburn Regional Partnership.